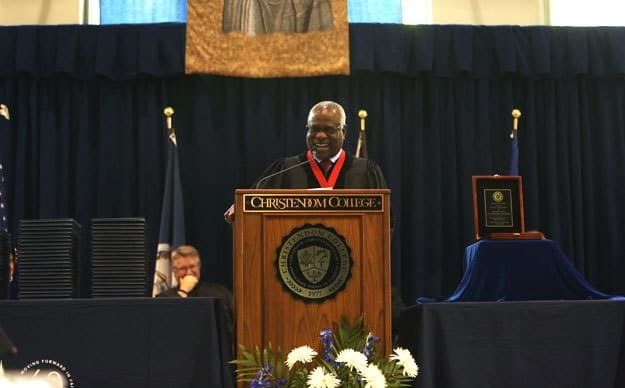 Christendom College celebrated commencement weekend on May 11-13, awarding 110 bachelor of arts degrees and honoring Associate Justice of the Supreme Court of the United States Clarence Thomas and Episcopal Vicar for Clergy of the Diocese of Arlington Fr. Paul Scalia. Justice Thomas was awarded the college’s Pro Deo et Patria Award and delivered the commencement address on Saturday. Fr. Scalia celebrated the Baccalaureate Mass on Friday and was awarded the college’s St. Thomas More Medal. U.S. Supreme Court Justice Clarence Thomas delivered the commencement address. Justice Thomas spent all of Saturday with the graduates, processing across campus to commencement with them and taking the time to shake each of their hands as they crossed the stage to receive their diplomas. During his commencement address, Justice Thomas congratulated the graduates on their milestone in Catholic formation and encouraged them to continue to grow in their Catholic faith as they go out into the world. Rev. 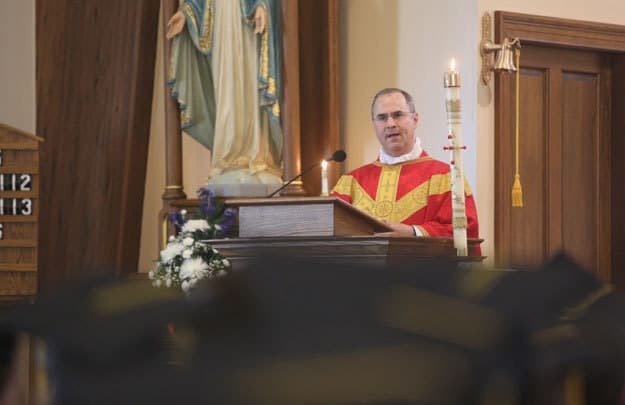 Paul Scalia received the college’s Thomas More Medal and celebrated the Baccalaureate Mass. Fr. Scalia, the son of late U.S. Supreme Court Justice Antonin Scalia, who was awarded the college’s St. Thomas More Medal for Defense of the Faith and Holy Mother Church on Friday evening, spoke on fear of the Lord during his remarks at the Baccalaureate Mass, relating that fear to the spirit that should fill every graduate upon such an occasion. 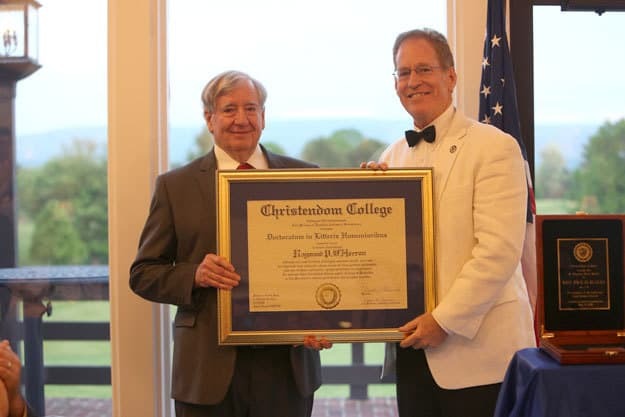 Founding faculty member Professor Raymund O’Herron received an honorary doctorate from Christendom, in honor of his retirement after 41 years of service. Founding faculty member Professor Raymund O’Herron, who retired this May after teaching theology and philosophy to thousands of students over the past 40 years, was deeply touched when the college bestowed an honorary doctorate in humane letters on him on Friday evening, and he received a long standing ovation from those who were present. Dr. Timothy O’Donnell closed the ceremonies on Saturday with his charge to the graduates. 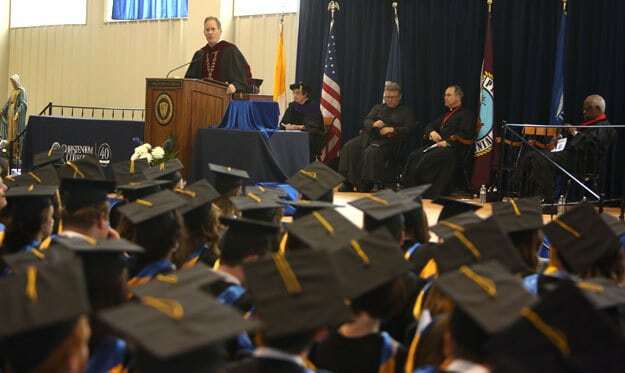 Closing the ceremonies on Saturday, college president Dr. Timothy O’Donnell delivered his charge to the graduates. 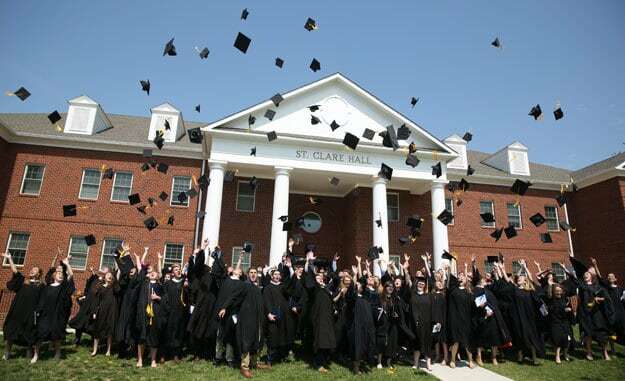 The Class of 2018 is the largest in Christendom’s history. The 110 members of the class of 2018 are Francis “Robbie” Adams, Jane Adams, Haley Ambreit-Quepóns, Elizabeth Anderson, ThomasAnderson, Mary Arnold, Emily Bailey, Gabriela Barajas, Anna Barren, Richard Blank, Catherine “Grace” Britten, Anthony Brooks, Josephine Brooks, Bryn Burgess, Aidan Callegari, Thomas Carney, Joseph Cavanaugh, Olivia Cerroni, Athanasius Clark, Julia Clark, John Paul Cook, Danielle Corcoran, Paulina Cuddeback, Joseph Cummings, Margaret Daly, Rebecca Derks, Jacob DeVos, Maximilian Dewey, Alexandra Di Falco, Zachary Doll, Sydney Dominguez, Gabrielle Donlon, Mary “Genna” Ellefson, Kylie Feiring, Alexander Forst, Mary Beth Francis, Sophia Fusco, Isabella Gadapee-Tilden, Catherine Gaetano, Bridget Gaffney, Cecilia Gallagher, Rachel Gerring, Margaret Golden, Sarah Jane Goodman, Alain Gratton, Emma Hackett, Mary Hays, Bridget Hebert, Chloe Herrmann, Mary Hoeck, Jensen Hoernig, William Johnson, Matthew Kavanagh, Carissima Keatley, Jack Lake, Danielle Lemieux, Dominic Mann, Angela Marsh, Melissa Marter, John Martz, Luke Maschue, Paul Maschue, Michael Mazzara, Clare McDermott, Maria McFadden, Ioana “Sophia” Mello, Sylvia Messing, Jacob Morris, Gabriel Murphy, Theresa Norris, Kevin Norton, Kieran O’Donnell, Sarah Obritsch, Catherine Olbrych, Elizabeth Peterson, Michael Piorkowski, Madeleine Post, Garrett Quigley, Anna Rakoczy, Luke Romanchuk, Leah Ross, Nicholas Santschi, Robert Scanlon, Mary Schneider, Fiona Shanahan, William Skuba, Daniel Snyman, Molly Spiering, Veronica Stephens, Mary Storey, Mary Strickland, George Summers, Matthew Summers, Ashlyn Thomas, Bethany Thornton, Matthew Trojacek, Marygrace Tucker, Winfield Turner, Danica Urankar, Sean Vance, Monica Vicente Gener, John Walsh, Alexander Watson, Logan Weir, Joseph Whittaker, William Wiegand, Katherine Williams, Eric “Joseph” Wilson, Morgan Witt, and Emma Wynne. Watch U.S. Supreme Court Justice Clarence Thomas’ Commencement Address. Watch Rev. Paul Scalia’s Remarks here. Watch Dr. Raymund O’Herron’s Remarks here. Watch Dr. Timothy O’Donnell’s Charge to the Graduates here. Watch Emma Wynne’s Salutatory Address. Watch John Martz’s Valedictory Address here. Watch the Class of 2018 Receive their Degrees here.